When war was declared in September 1939, some French Foreign Legion units were sent to France to help defend the mother country, and others were raised from the many volunteers eager to fight. By the time Germany invaded France however these were ill-prepared, and largely disappeared in the defeat that followed. However some legionnaires had been sent to Narvik in Norway, and were in the UK when France was overrun. While many of these chose to be repatriated, some stayed on under de Gaulle as Free French. They were subsequently sent to take Dakar, stormed Libreville in the Gabon and participated in the successful campaign to eject the Italians from Eritrea in 1941. Later they played a part in the taking of Syria, held by Vichy-French forces including FFL, and then became attached to the British Eighth Army where they fought in the Western Desert. Their most notable action was a heroic defence against the Axis at Bir Hakeim in May/June 1942. This was the famous 13th Demi-Brigade Légion Étrangère (13th DBLE), but the rest of the Legion had remained loyal to the puppet Vichy regime in France. However when the Allies invaded Algeria the Vichy troops put up little resistance and soon joined the Allies, after which the Legion fought in Italy, France and eventually Germany and Austria until the war’s end. From their appearance these figures do not depict the men in the initial campaign in France (when ordinary infantry uniform was worn), nor the Legion that remained in Africa and the other colonies (that wore their own colonial uniform), nor the Free French forces after mid-1943 (when the Americans supplied them with American clothing and weaponry). Instead, they depict the original 13th DBLE, who after Narvik were given British battledress and khaki drill tropical uniform, and sent to Africa and the Middle East. All but one of the figures here wear standard British KD tropical uniform of shirt and shorts, with socks and boots, the top of which is covered by an anklet. One figure wears standard British battledress instead, which is equally valid. Nearly all the figures wear the classic French kepi, mostly found in Syria, which the troops were very proud of as a clear sign of their nationality despite wearing British uniforms. In fact most of the time they would have worn their steel helmet when in action, so while the kepi was worn it is unclear how often this happened when in combat. In general the kepi was worn for parade, behind the lines and when cameras were present, but if the soldiers had been modelled with the standard steel helmet then they would look little different from ordinary British troops, so the decision is easy to understand. A couple seem to have either French or British tropical helmets instead, again likely taken when in Syria. Finally, most wear the cheich, the scarf that was such a symbol of the Legion. For much of the time, and particularly after gaining the stockpiles in Syria, the Legion retained their French-pattern leather webbing, which everyone here wears and is good to see. The ammunition pouches too are French, but otherwise kit is very light here. In particular, many have no form of water bottle, which is surprising, and all those that do have the British model when our sources say that they carried the typical French style, the two-spout bidon, although whether this is more true at some points in the campaign than others is unclear. The set comes with a good many poses, which include a lot of running and advancing poses, which we liked. There are some shooting poses too of course, but almost none that are prone or kneeling, which we would have liked to have seen, particularly as some of the battlefields would have had little cover available. Half the poses are holding a rifle, which in most cases is clearly the French MAS.36 model, which is correct, but a couple are too indistinct to know for sure, but are probably the same. No less than three are holding or using the FM 24/29 light machine gun, another well-used French weapon at the time, and a couple more seem to be carrying the M1A1 Thompson submachine gun. The heavier machine gun in the bottom row is the Hotchkiss M1914, still widely used in the 1940s, and here it has both the gunner and a number two feeding ammunition. The number two also has a Thompson strapped to his back (which is unusual as they were supposed to have only a pistol), and the penultimate figure in the last row seems to have a MAS-38 submachine gun with the slightly slanted magazine, but noticeably shorter than the real thing so not well done. So there are some good weapons here, and some reasonably active poses to use them too. Sculpting is quite good, with variable detail on the weapons but fairly good clothing and faces. Some of the rifles seem to have the correct spike bayonet attached, but this thin item is not well done here, being a bit too fine for this standard. There is a little flash, and occasional excess plastic in areas the mould cannot reach, but nothing exceptional. The tripod of the Hotchkiss is however very much of a compromise as one of the forward legs has been turned completely around in order for it to be moulded as a single piece, which does make it look quite strange. Also the number two holds what should be a strip of ammunition, but what he actually has in his hands is far too short to be such a strip. 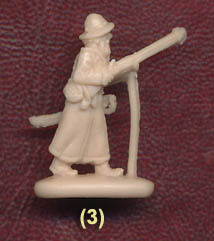 There are some nice elements here like the goggles being worn by the Hotchkiss gunner, but these figures perhaps represent an ideal more than the reality of such troops in action, which is obviously very common in this hobby. Before the invasion of Syria the beret, as worn at Narvik, was the most common headgear, so this set could usefully have had a couple of those too, and also side caps, but such variety might be stretching the scope too far and deprive the set of its homogeneity, so their absence is understandable. Another compromise is that while the Hotchkiss gunner is holding the trigger, there is no ammunition strip in the weapon, therefore it cannot be being fired. So not perfect, but actually a fair reflection of what many people visualise these men to look like in 1941 to 1943, and with decent sculpting and a good range of poses this is a set worth having, particularly as there are so few sets of French troops for World War II currently.